True, the Tasmanian devil is close to our hearts. But there are other famous Tasmanians too. Famous for being a remarkable and unique animal, now believed to be extinct. Famous for starring in The Guardian, The Devil Wears Prada and The Mentalist and other TV and film productions. Famous for his roles in many well-known pirate movies of the 1930s and 1940s. And yes he did star in other kinds of movies too! Famous for becoming a royal celebrity when she married Prince Frederik of Denmark. Not to mention all the terrific work she does for charity. Famous for being an outstanding cricket player, holding many records in the sport. 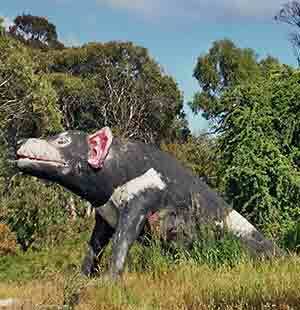 A much-loved icon of Tasmania, the Tasmanian devil is probably the most famous Tasmanian. How did this creature become so famous internationally? That would be mostly due to "Taz", the Looney Tunes cartoon character version of this unique animal. When I think of Taz, what I remember most of all is how he would spin madly devouring everything in his path. Well the real Tassie Devil is not quite like that. However, like Taz, the real creature does have powerful jaws and a strong bite. A marsupial (like the Tasmanian tiger), the Devil has black fur with white patches. It resembles a small but well-built dog. I took this photo outside the Trowunna Wildlife Park. And yes this is an extra large statue, the animal is not that humongous. Sadly, the devil population has vastly diminished over recent years. This is largely due to the Devil Facial Tumour disease (DFTD). It is a fatal condition, and no cure has been found as yet. Roadkill is also a major cause of devil deaths. So please do slow down when you see the wildlife warning signs.